A couple of doors down from the Brigadier in the ground floor flat of number 23, you will find Becky Starstruck. Becky made her name and wealth by being an astrologist to the rich and famous during the 1980’s. She called her love child ‘Cerinthe’, after the flower but never let on to who the father of the girl was. Becky would hint it was Simon Le Bon but folk in the street said it was ‘Freddy’, as in Rod, Jane and Freddy. Cerinthe comes to give me a hand in the Higgledy Garden now and then…to my mind she looks more like Bungle. 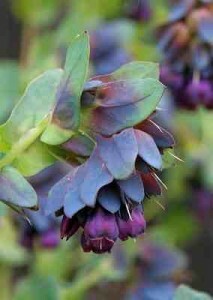 What is Cerinthe Major ‘Purpurascens’. Honeywort? This wonderful and charming flower fell out of grace with gardeners for many many years and it is only in the last decade that it is creeping back into the gardens of the chic and knowledgeable. She has large, glaucous greeny-blue leaves, becoming progressively bluer as they rocket up the stem, and terminating in a thick cluster of deep blue bracts with a deep purple hood with a white center. If Cerinthe major were a novel she would be a Gothic masterpiece…probably involving vampires and innocent young ladies. The name ‘Honeywort’ comes from the fact that bees go somewhat potty for it. Grow lots of these and the stripy little chaps will be all over your garden and livening up the food chain. 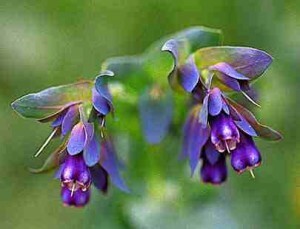 This all sounds well and good Mr Higgledy but how do we grow Cerinthe major ‘Purpurascens’? *First of all you should know Cerinthe major is a hardy annual. 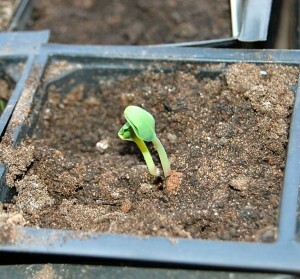 *It is possible to sow ‘cerinthe major’ outside in April. Give them about 8 inches of space between plants. 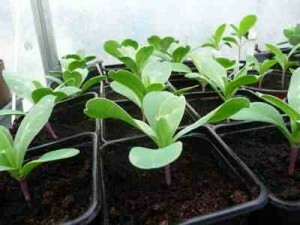 * Preferably, I think it best to sow in pots in early spring (some folk start in January! )…then let her loose in the soil after the frosts and pottered off up north. *They should be about three inches tall when you plant them out, big enough to handle the weather if it suddenly turns chilly again. *Ensure your bed is well prepared with organic material dug in and that it is full sun. *They are NOT drought tolerant, so keep them moist if you can, especially in spring whilst they are growing up. *You will discover (to your joy, I am sure) that the plant turns an even deeper blue as the cold nights of Autumn start drawing in. Wonderful stuff. If you decide to use this beauty as a cut flower it is of my opinion (and I have many) that you should seal the ends of the stems in boiling water for 30 seconds in order to increase the vase life. So Where Can We Buy Cerinthe Major Seeds? Cerinthe Major. Update. 20th Feb. I sowed some cerinthe last week and left them on the windowsill. They have just started to pop through. Photo below. 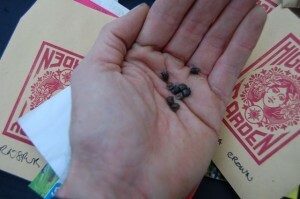 Ricinus	The Higgledy Garden Cross Africa, Continental Triathlon…sort of. Love this flower..so do the bees!